Plot: Put a random 0-cost card into your hand. Suran Pawnbroker is a rare Agility creature card. It is part of the Houses of Morrowind expansion. "Have business with House Hlaalu?" "My business is none of theirs!" 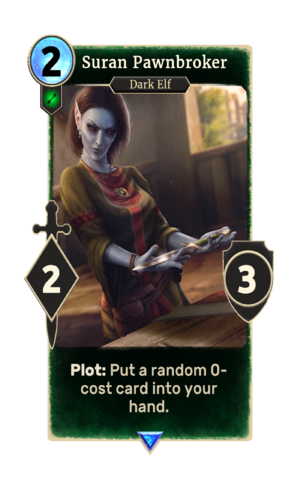 The card depicts Ravoso Aryon who was the resident pawnbroker of Suran in Morrowind. Her summoned line references her membership of House Hlaalu. This page was last modified on 2 March 2019, at 00:20.